In garments manufacturing fabric cutting means to cut out the garments pieces from lays of the fabric with the help of cutting template or marker. Cutting is one the major step to make a complete garment. For cutting of fabric generally the marker is applied to the top ply of a lay. In garments manufacturing industry the term cutting is used in different meaning. Here the term cutting is used in the sense of cutting room which indicates an area which normally includes the activities of marker planning, spreading and preparation for sewing. To separate fabric parts from the spread of lay according to the dimension of the marker. To make the garments according to required design and shape. To prepare garments pieces to go forward with next process of garments manufacturing. To achieve the required objectives by cutting of fabric in garments manufacturing process, the following requirements must be fulfilled. By following production planning at first sample is collected from sample section with pattern and garments approved. e Item, fabric width, color etc. After putting all information in order sheet then send to CAD section for marker making. Or if it is to do manually than make marker manually. Checking marker after getting marker. Sending fabric requisition from cutting section to store for cutting according to plan. Receiving fabric in cutting table as per marker and cutting plan. Matching fabric to trim card by merchandiser approved fabric. Then starting layering manually or with machine. Completing layering then spread marker upon on the fabric. Marker checking by quality people & keep all document of style , size wise report to send to store & sewing section. Before cutting attaching clamp and gum tape on the layer. If there is any drill mark in marker then need to drill. Starting cutting by cutter man. Then dividing group and ratio wise. Make bundle chart as per lay order sheet and sending for bundle card printing. Numbering as per bundle chart wise. If there is any fault need to replace cut bundle roll and shade wise then bundle and send to sewing section. If there is any fusing or embroidery then send for this process. 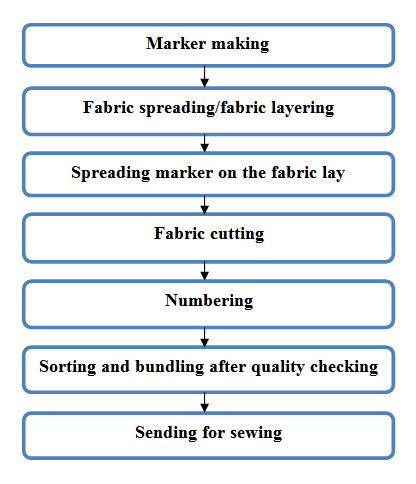 Tagged classification of fabric cutting, cutting room overview, Different types of fabric cutting, fabric cutting procedure, fabric cutting section, Fabric spreading and cutting section in garments industry, Flow chart of cutting during garments manufacturing, Flow Chart of fabric cutting, Methods of cutting, Objectives of Cutting, Process flow chart of garment manufacturing, Process Sequence of Fabric Cutting, Process Sequence of Fabric Cutting Section, Requirement of fabric cutting, Stages of fabric cutting, Working procedure in fabric cutting, Working procedure in fabric cutting section. Please tell me what type of clamp and where it is placed on the fabric (step #11). a photo would be appreciated. Thanks for your writing. It’s essential for a textile engineer.